The decorating is all finished and our guest room is ready. The grandgirls and their father will be arriving tomorrow, and the rest of the family will be here Christmas Eve. I haven’t shown you the guest bedroom in a long time. That’s because I’ve been gradually making some changes in this room over the past year. Previously, I had used a lot of blue in this room. But i decided to go more neutral with the bedding. 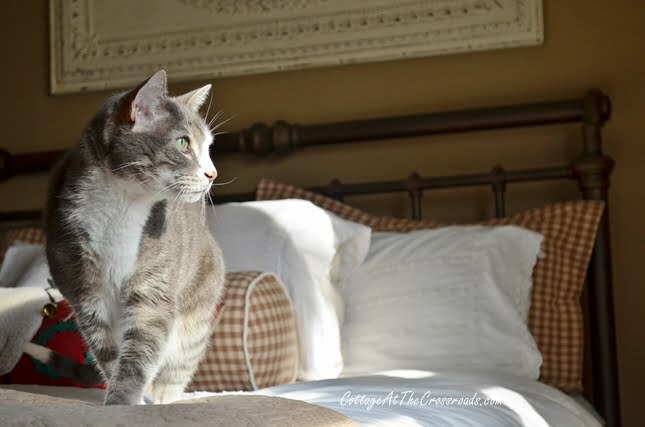 The brown toile window treatments were made by my friend Brenda. She also made the linen bed skirt and the checked pillow shams and boudoir pillow. 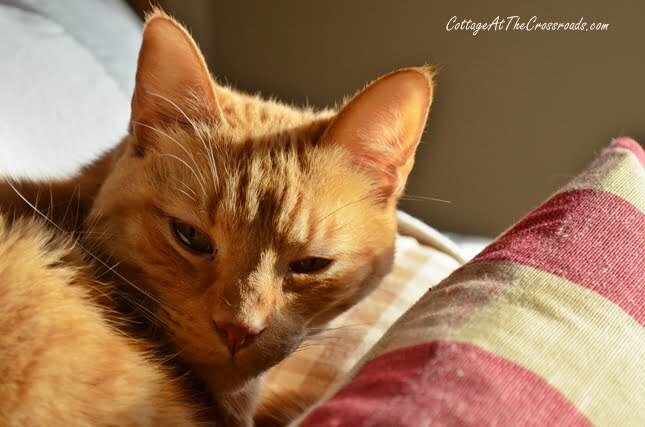 Do you spy a kitty on top of the pillows? To add a little touch of Christmas to this room, I hung a little berry wreath on the metal mirror that’s over the bed. And I added this red pillow with the sheep on it. Here you can see it a little better. 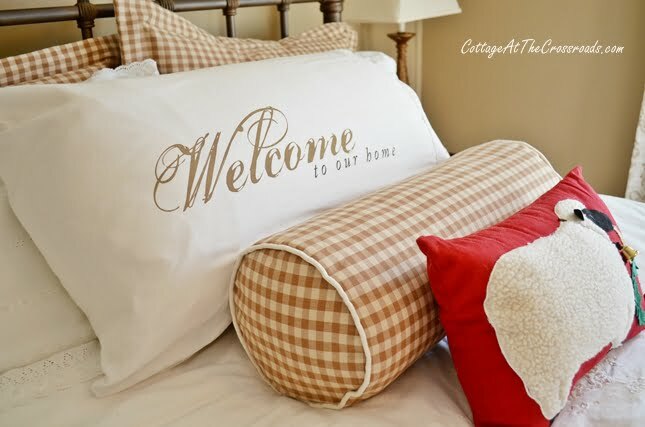 And I had the good fortune to win the red and cream buffalo checked pillow from the blog For the Love of a House recently. I have been following the renovation of Joan’s beautiful farmhouse for several years. And if you have never visited the blog, prepare yourself to be amazed! 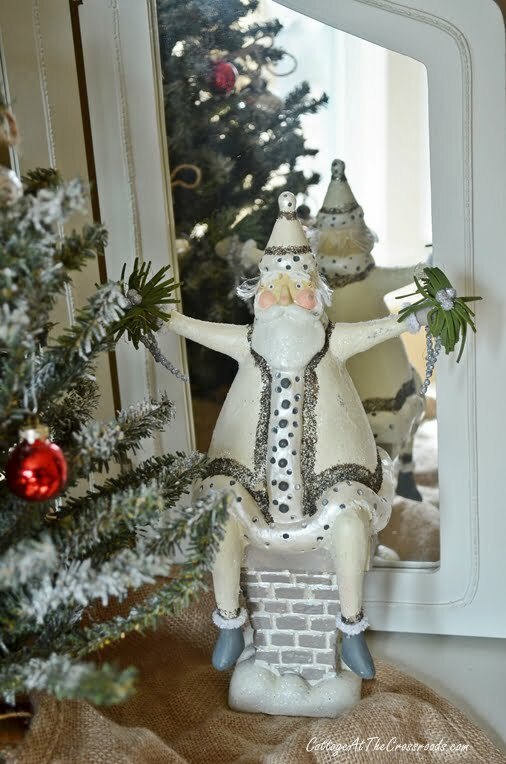 There ‘s a little Christmas tree in here as well as Santa! Henry has been counting sheep in here. And Rascal like to snooze in here, too. 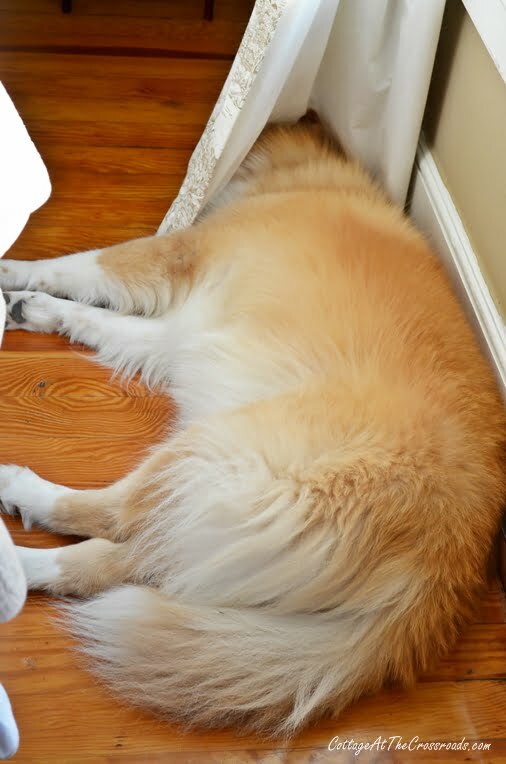 Even Lucy likes to nap in here as well! Over the next few months, I’ll show you more of the guest room as I have a few pieces that I want to paint and put in here. I’m sharing a few more photos of our decorations. 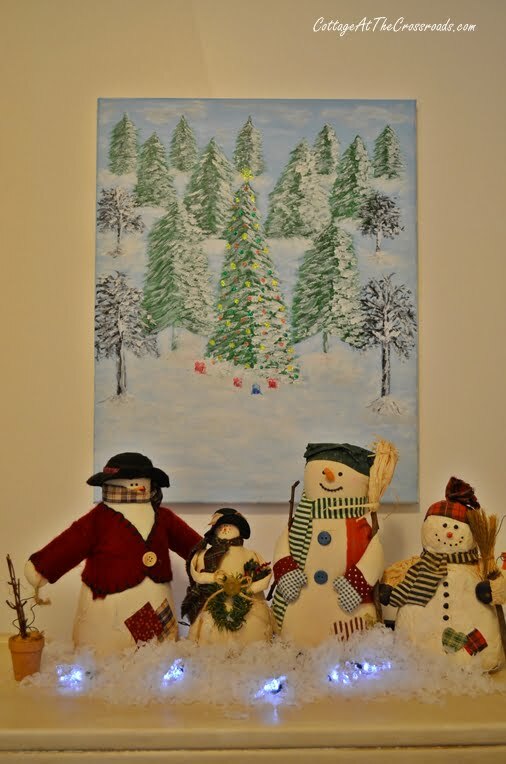 In the hallway is a vintage snowman collection with a snowy painting by my friend Marti. 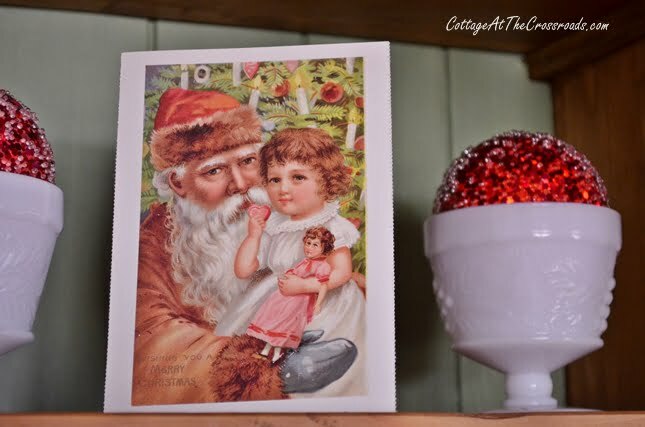 I put out these reproductions of vintage Santa postcards on our cupboard. I have enjoyed them so much because the art work is just incredible. I kept thinking that I’d come up with a project using these cards, but I never did. Perhaps next year! 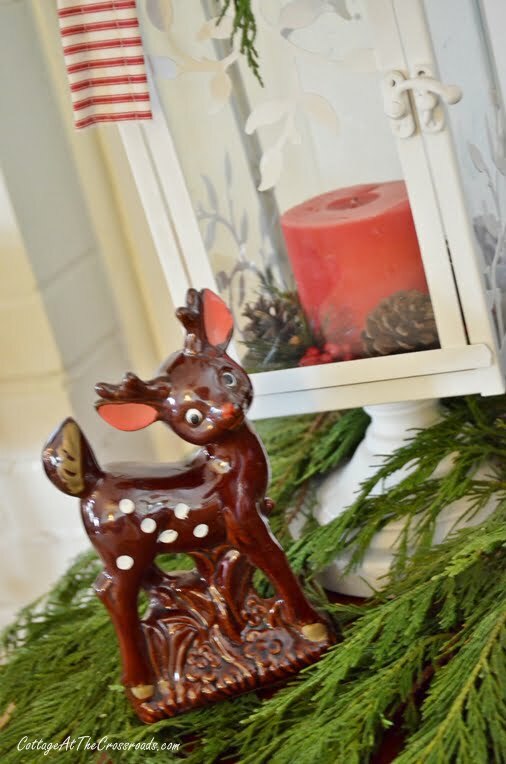 I will have to say that I’ve really enjoyed decorating with a lot of red this year. I used red burlap and red ticking to make the garland on the tabletop tree. 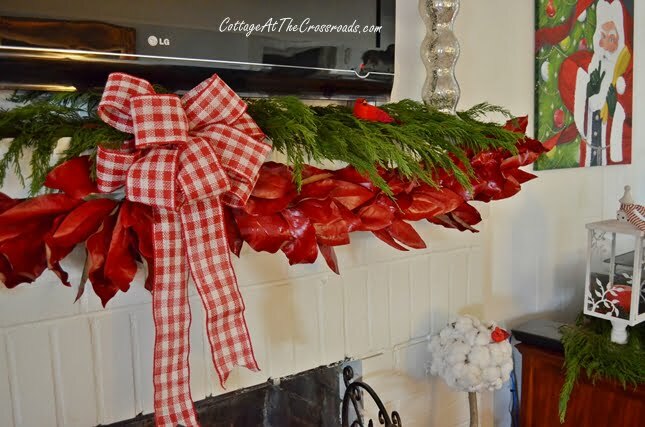 The spray painted magnolia leaves made such a striking garland on the fireplace. 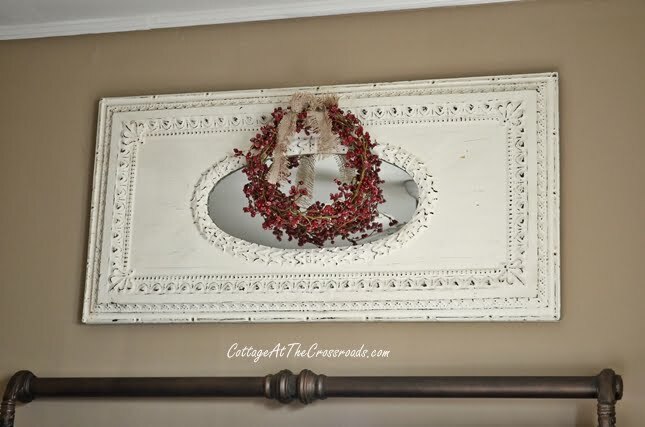 Since someone has asked, I used Valspar gloss spray paint in Ruby to paint them, and I followed Kristen’s directions on how to create the garland HERE. The leaves have gotten just a little crinkly from the heat of the gas logs. I think that’s because I didn’t paint the back of the leaves. 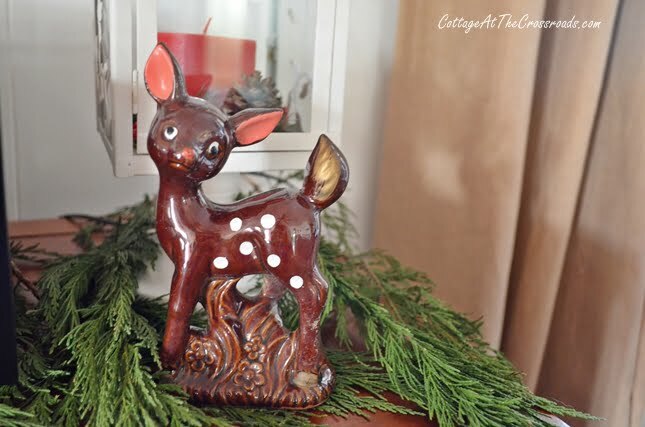 This little vintage reindeer was found at the auction this summer. Along with its partner. I think they are so cute! Well, I have enjoyed sharing more of our home with you and I won’t be posting for a few days. I’m wishing you all the joys and wonders that this season can bring! I absolutely love the bedroom update! I have been looking for that exact bed. Would you please tell me who makes it and where I might find it? Thanks so much for visiting our blog, Jessica, and leaving your compliments about the bedroom. We purchased the bed about 12 years ago but the company is still making it. It’s a Wesley Allen and the style is called Sheffield. It is a very sturdy and well-made bed and it comes in different finishes. Ours is bronze, I think. You can go to their website to find a dealer near you. Good luck in your hunt! I love your fireplace guard, where is that from? Lovely! What is the wall color in your guest room called? Love that tree! I’m doing a table top too. Don’t want to drag out the big tree. Everything looks so cheerful and welcoming! Love what you’ve done. It is so nice to see a “real” home. 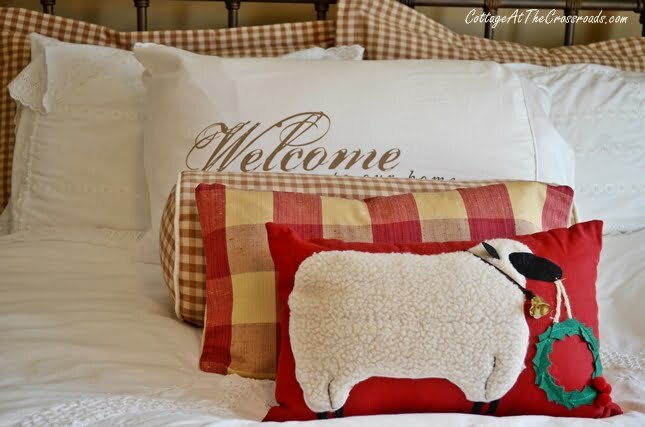 Where did you find the sheep pillow on the guest room bed, I collect sheep and this would be wonderful. Love the magnolia leaves, and such a great idea to spray paint them. 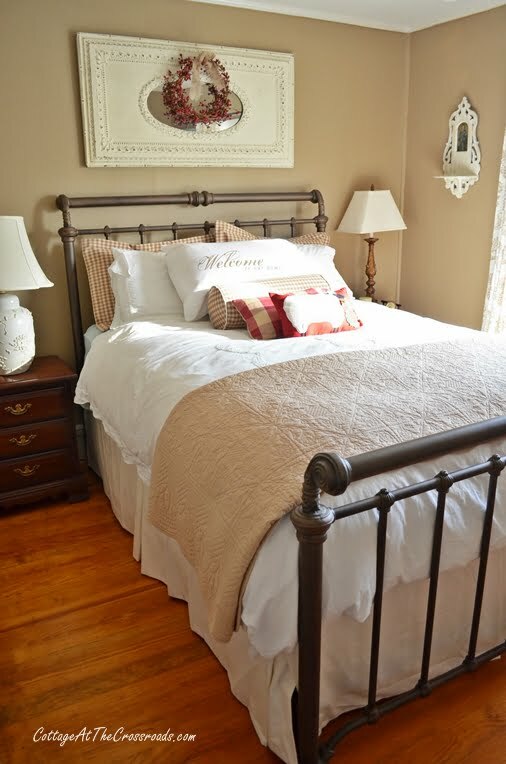 I love the guest bedroom……what is the name of thee paint color? Merry Christmas and a Happy New Year. 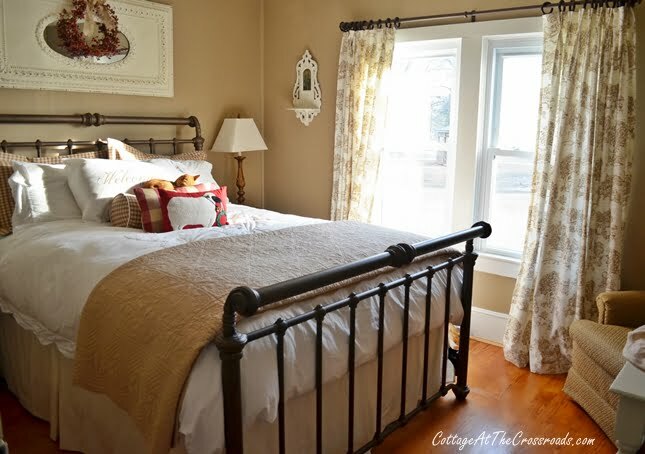 Love the bedroom…and never thought to spray paint magnolia leaves red..they are stunning! 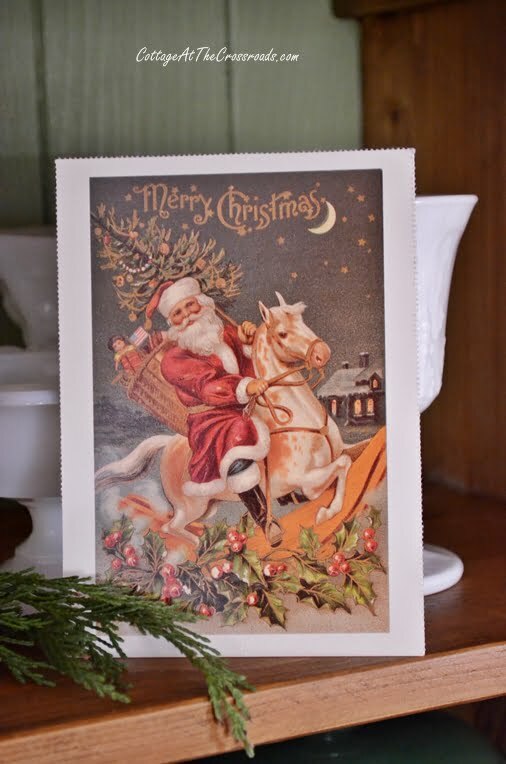 !..Gorgeous mantel…loved seeing the kitties!…Merry Christmas Jane and Leo! Very pretty, Jane. I love that bed. Have a very Merry Christmas! Beautiful! I don’t blame the kitties or Lucy wanting to sleep in there all the time! Love the magnolia leaf garland! Just something for everyone to keep in mind, especially during the holidays, but really anytime you are thinking of having overnight guests. 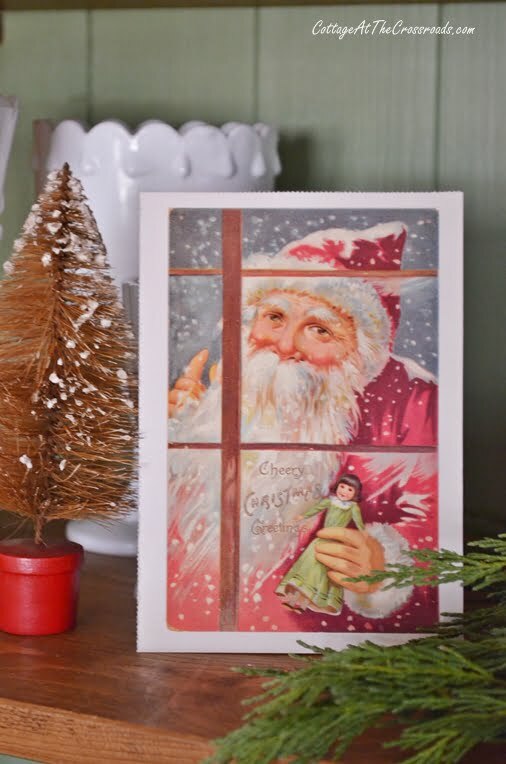 Thank you for sharing your home, and Merry Christmas to you and yours! No worries this time, Becky! The family members that are coming are not allergic to cats! But you have a good point. Most of the time the door to this room is closed and off limits to the animals. Thanks for following and Merry Christmas! Do not worry becky you are not invited nor ever will be . Good grief some people just have to open their pie hole and be so insulting. Jealous are we becky? Your name does not even deserve a capitol b. If you do not have any thing good to say, just be quiet. I’m sure Jane is aware of situations as she seems very very intelligent. Be Nice. CHEERS!!!! Jane, everything looks beautiful! 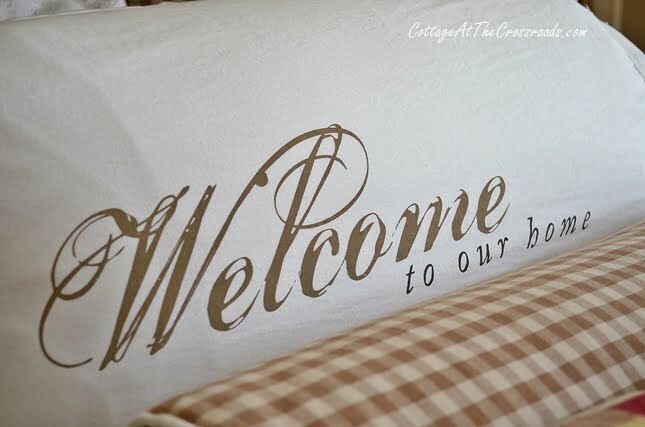 I love the guest room, and all your special touches. Love the snowmen. I collect them too! Your mantel is lovely. Hope you and your family enjoy your time together. Merry Christmas!! So beautiful Jane and I loved seeing the cats all enjoying themselves. Merry Christmas t o you and your family! ! ! I love those cotton topiary trees. I got a better look at them in this post. Everything looks so festive. Merry Christmas Jane and Leo! Very pretty with the touches of red. So charming. 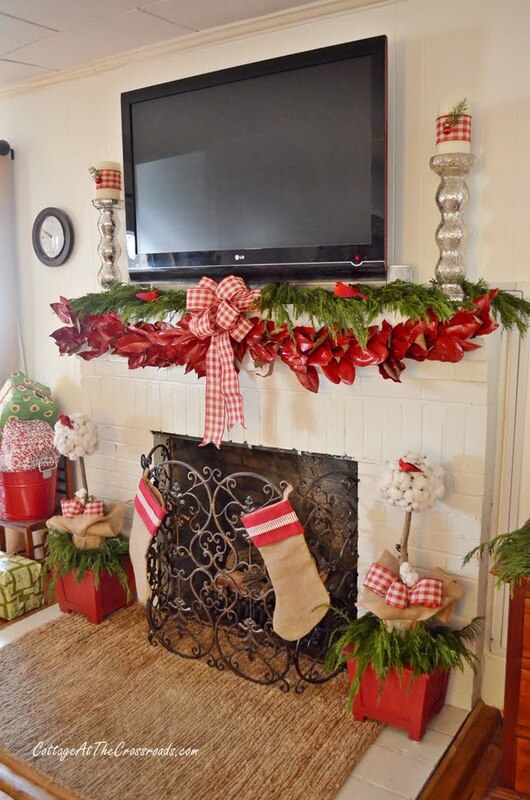 I love the mantle with the magnolia leaves. Merry Christmas. I love your guest room! What a way to greet them with that lovely pillow! 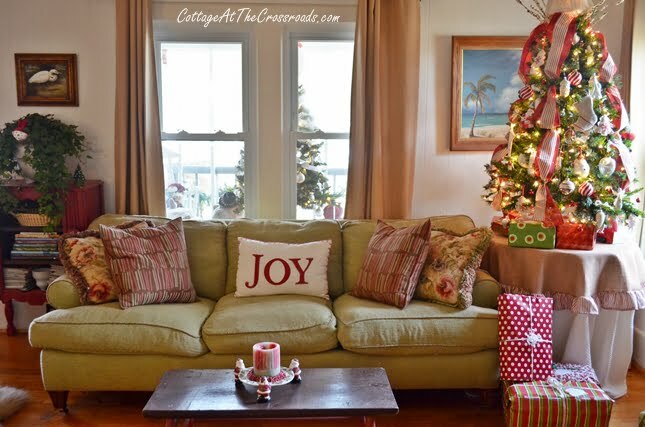 I love everything you have done to your home and it is so cozy looking. Merry Christmas to you and your family!!! Jane, that guest bedroom is wonderful. The colors are wonderful and soft but great for a man to stay in too. I love that mirror above the bed! It looks lovely, Jane! Merry Christmas!